Whether you opt for our Men's REGAINE® Extra Strength Foam or Men's REGAINE®Extra Strength Topical Solution, the product should be used every day, twice a day, for the best possible results. Find out more about our product range. 1Self Assessment after 16 weeks of treatment. Olsen EA et al. J Am Acad Dermatol. 2002 Sep;47(3):377-85. How do REGAINE® products work? When it comes to hereditary hair loss, there are a number of factors at play; hormones, age and genetics all play a big role in the progressive shrinking of scalp follicles, a process called miniaturisation. The miniaturisation process causes a shortening of the hair’s growing cycle, and prolongs the resting phase. As this progresses, hair may appear thinner, and there may eventually be no regrowth at all. While the exact mechanism of action of REGAINE® is uncertain, researchers believe that REGAINE® works to partially enlarge the hair follicle and reverse1 the process of miniaturisation.2 By enlarging these follicles, the growth cycle of the hair is prolonged, and more follicles will be in the growth phase at the same time. This contributes to thicker, fuller-looking hair, and improved coverage across the scalp. 1Olsen EA et al. J Am Acad Dermatol. 2002 Sep;47(3):377-85. What's the difference between REGAINE® Foam and REGAINE® Solution? Men's REGAINE® Extra Strength Foam is the only foam proven1 to regrow hair.2 It needs to be applied differently as it’s a foam, not a solution. In contrast to REGAINE® Extra Strength Topical Solution – where a dropper (applicator) is used to spread the product onto the hair loss area – the foam is applied to the scalp and then gently massaged. What are the most common side effects of REGAINE®? Side effects of using REGAINE® will vary between individuals. Some people may find that using REGAINE® causes them to experience a dry, itchy scalp, along with some irritation. For others, unwanted facial hair may begin to appear while using Men’s REGAINE® products – this will eventually disappear if and when the use of REGAINE® is discontinued. Ultimately, all medicines can have side effects. Sometimes they are serious, most of the time they are not. But do not be alarmed, you may not experience any side effects at all. If you get any side effects that worry you, talk to your pharmacist or doctor as soon as you can. Are there any medications that may interact when I'm using REGAINE® products? At present, there are no known drug interactions associated with medication taken orally, and the use of REGAINE® products. If you currently use any form of topical medicine or treatment on your scalp, DO NOT use REGAINE® at the same time. If you take any other medications, or if you require any clarification, please consult your healthcare professional before you start applying REGAINE®. Most people will see results within sixteen weeks after they start using REGAINE® products. Results may vary from person to person, however for the best possible results we recommended developing a consistent, twice-daily habit of applying REGAINE® directly to the scalp. You can find a tutorial of how to use the product correctly here. If you don’t see any results at all within the first sixteen weeks of regular usage, please contact a health care professional. is there a way to know that REGAINE® products are working? Yes – there are a number of tell-tale signs which show you that the REGAINE® products are having a positive effect. It’s important to remember that individual results may vary – not everyone responds in the same way to REGAINE®. If your initial hair loss continues after two weeks using REGAINE® regularly, stop using the product and consult your health care professional for advice. I just started using REGAINE® and I've noticed that my hair loss has increased. is this typical? During the first two weeks of using REGAINE® products, it’s not unusual to experience more hair shedding than usual. This is because REGAINE® products stimulate the hair follicles to change from the resting to the growth phase, pushing out the older, weaker hairs to make room for healthy new ones! It’s a little like losing baby teeth to make room for adult teeth – a natural part of the regrowth process. The slight increase in shedding is only temporary. Within a couple of weeks it should have subsided as the new hairs begin to grow. If, after two weeks, the increase in shedding is still causing you concern, please speak to your health care professional to rule out any other possible medical problems. Healthier and thicker-looking! 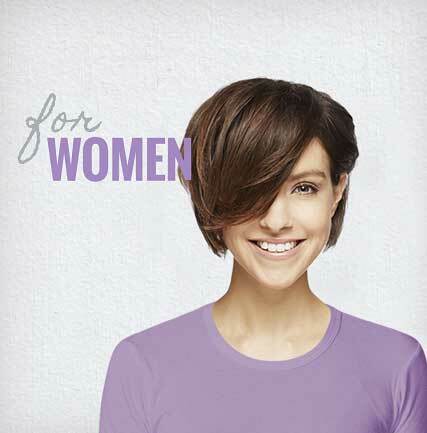 The hair that is growing in as a result of REGAINE® usage may appear soft and downy, without much pigment at first. With continued treatment, the new hair will thicken and become the same consistency as the other hair on the scalp – which means increased coverage and volume. Many people experiencing miniaturization find that their existing hair appears to be thinning, with changes in texture as the follicle begins to shrink. REGAINE® also helps to stimulate those follicles, to regrow healthier and thicker looking hair over time. How long should I continue to use REGAINE®? Hereditary hair loss is a lifelong condition which requires continuous use of REGAINE®. For best results apply twice daily directly to your scalp. If you miss a dose, there won’t be any instant, negative effects- however by making it a part of your daily routine it will become a habit—just like brushing your teeth! I missed a dose of REGAINE®. Will my hair loss start again? Don’t worry – missing one or two doses of REGAINE® won’t have any kind of negative impact on your long-term hair regrowth, As long as you have been regularly applying the product to your scalp twice daily at the recommended intervals. If you’ve missed a few applications, try to resume your regular use of REGAINE® as soon as possible. Do not double-up or apply extra product to make up for the missed doses – just continue to apply REGAINE® as you usually would, and you shouldn’t see any negative results. what happens if I stop using REGAINE®? There is no ‘cure’ for hereditary hair loss, and any REGAINE® treatments to help stimulate hair growth and prevent future hair loss will need to be continued indefinitely. If you stop using REGAINE®, your hair will revert back to the growth cycle it fell into before you started the treatment. Within three to four months the hair that you’ve regrown thanks to REGAINE® will begin to fall out, and the hair on your head will gradually regress into that pattern of hair thinning and loss that caused you to seek REGAINE® in the first place. Continued use of REGAINE® is required to maintain and improve hair regrowth. That’s why we recommend that you make the treatment part of your daily schedule – just like brushing your teeth! how long can I use REGAINE®? Whilst our clinical study was conducted for 48 weeks, there is no limit on how long you may use REGAINE®. For best results to increase and keep your hair regrowth, continued use is necessary, or hair loss will begin again. Fact: Both men and women can carry the genes for hereditary hair loss – and it can even skip generations. It’s likely that you’ve inherited a mixture of your parents’ genes when it comes to your hair, so looking at just one parent may not give you any conclusive predictions about your own future hair loss. The best advice is to look at all of the men and women in your family, spanning multiple generations if possible. General rule of thumb states that if your family have retained the majority of their hair, it’s likely you will too. Fact: Hair treatments like bleaching and regular colouring can be tough on your hair – but there’s no chance that they can cause hereditary hair loss. Many people experience breakage as a result of the strong chemicals needed to colour hair, and this can give the illusion of hair loss. In reality, it’s nothing more than unhealthy hair that just needs a little TLC (Tender Loving Care!). Myth: There's nothing available that helps stop hereditary hair loss. 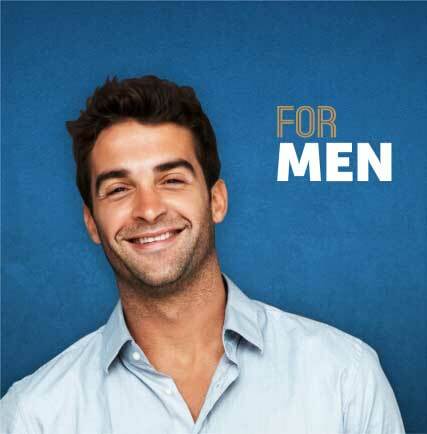 Fact: A study for Men’s REGAINE® Extra Strength Foam showed that following 16 weeks of treatment, 9 out of 10 men said that they kept or regrew their hair*. * Self Assessment after 16 weeks of treatment. Olsen EA et al. J Am Acad Dermatol 2007; 57; 767-774. Individual results may vary. does exposure to the sun make hair thinning worse? No, the sun will not affect or worsen hair thinning. A bit of vitamin D from the sun’s rays is good for you; however it is always advisable to wear a hat or sunscreen to protect your scalp from the sun. If you need to apply sunscreen to the scalp, it should be applied four hours after the application of REGAINE® to ensure that the sunscreen does not interfere with the effectiveness of REGAINE®. If it is not possible, the sunscreen should be applied no sooner than two hours after application of REGAINE®. For your second daily application, the sunscreen should be shampooed off the scalp. If your scalp gets sunburnt do not apply REGAINE® until the burn has healed. If you choose to wear a hat as an alternative to sunscreen, make sure you wait at least one hour after using REGAINE® before wearing your hat. can I still use my regular styling aids, like hair spray or gel, when using REGAINE®? REGAINE® does not interfere with your hair styling products, so you may continue with your normal hair care routine. We recommend you apply REGAINE® first, let it dry, and apply your styling products as normal. can I apply REGAINE® to wet hair? To get the most out of your REGAINE® products, always apply REGAINE® on dry hair. REGAINE® should not be applied to wet hair. It is not necessary to shampoo before applying REGAINE®, however if you do wash your hair wait until your hair is absolutely dry before using REGAINE® as it must be applied to a dry scalp. A hairdryer may be used to dry your hair after you have washed it, but do not use it to dry the REGAINE® product after applying it. As REGAINE® needs to be in contact with your scalp for at least four hours at a time, do not wash or wet your hair scalp for at least four hours after use. You can use REGAINE® after swimming, as long as your scalp is dry before applying. can I get my hair wet after applying REGAINE®? You can certainly get your hair wet after applying REGAINE® to your scalp. If you’re caught in a little drizzle outside, that’s alright. Naturally, we won’t advise you to dive into a pool of water or charge right into heavy rain right after application! After applying REGAINE®, you should wait approximately four hours before you get your hair wet. This will allow enough time to pass for the product to dry and start working. We recommend applying the product to a dry scalp for the best results. REGAINE® can be incorporated into your normal hair care routine. We recommend using a mild, gentle shampoo if you have a dry or flaky scalp. You might consider using PREGAINE® shampoo which is an innovative gel shampoo scientifically formulated to effectively and gently clean your hair. It’s suitable to be used alongside REGAINE® as it won’t impede absorption of the active ingredient found in REGAINE®. Other topical medications should not be used on the scalp while using a REGAINE® product. If the condition persists and generates irritation to your scalp, stop using it and speak to your health care professional.